Vehicle Maintenance Scheduler is a free app for Windows 8 and 8.1 which has a primary strength of allowing you to fill in the details of your vehicles and reminding you to keep it serviced. The app reminds you for servicing your vehicle via toast notifications, and it also allows you to keep track of multiple vehicles. In the main screen, all you have to do is to keep adding the vehicles that you own, and the app will present you with tiles of the vehicles which you keep adding. You can then click on these added tiles to manage these vehicles. Vehicle Maintenance Scheduler is available for free from the App Store. 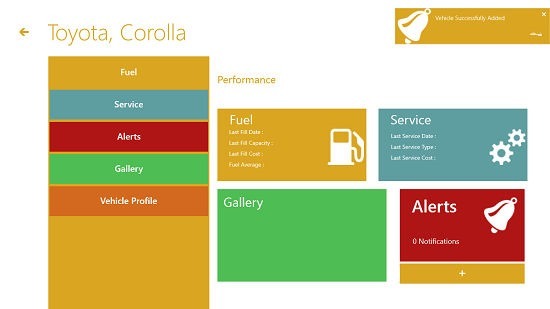 The Home Screen Of the App: When you launch the app, you will be shown a very clean interface which allows you to input your vehicle type, and also allows you to read through a brief introduction. The main screen of the app resembles the screenshot attached. 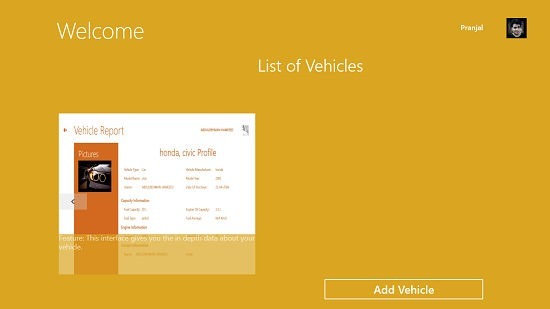 You can see that the app picks up your name and your display pic from your Microsoft id or the local account, which you use to log in to your device. In the small sized square box, you can see the brief introduction to the app. You can add a vehicle to the app via the Add Vehicle button at the bottom right of the screen. Let’s have a closer look at how this can be accomplished. 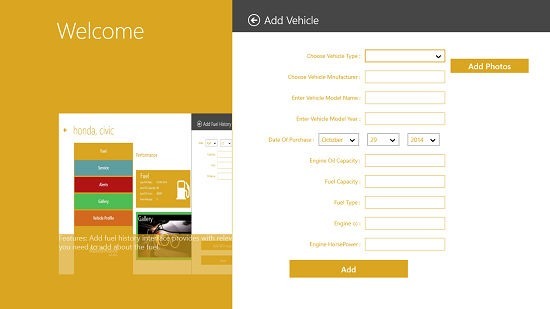 Adding Vehicle(s): When you click on the Add Vehicle button, a pane flies in from the right side of the screen, where you can enter your vehicle’s details like its make, model, manufacturer, date of purchase, engine power, horsepower, etc. Simply fill up all the fields, and finally click on the Add button. As soon as you click on the Add button, you will be shown a toast notification confirming the process of addition of the vehicle at the top right, and you can then click on the tile of the vehicle that you have just added to read its details. When you click on the tile of the vehicle, you will be shown the following screen. Adding Service Details: As you can see in the screen above, the service and the fuel fields are empty. To add info in these fields, simply click on the + button at the bottom right, and choose if you want to add service or the fuel details. I chose to add the service details. Simply fill up the pane that flies in from the right side in the above screen, click save and the service history will be saved. You can see the service tile showing the last service in the screen below. Similarly, you can set alerts, add fuel history etc. 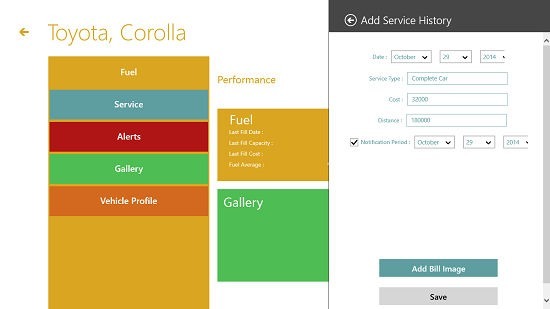 Vehicle Maintenance Scheduler is a great free app to keep track of and ensure that your vehicle gets serviced on time. The overall interface of the app with its large tiles is completely optimized for touch screen as well as non touch screen devices and this makes for a great overall experience in terms of usability and versatility.